Competitive karuta is a Japanese classic card-game. 100 cards, each has different poem. A reader read the poem in random order, and for each poem being read, two players are trying to be the fastest to get the card with correct poem. Sounds simple at the beginning, but watching this anime will get us to understand how complicated it actually is. Our heroine, Ayase Chihaya is a very beautiful high-school girl with extreme obsession of playing competitive karuta. It all started back in her childhood when she played with two boys, her childhood friends: Arata and Taichi. Since karuta is a Japanese game, being the best karuta player in Japan means a person is also the best player in the world. And for this reason, Chihaya is inspired to become Queen, the title for the female karuta champion. Chihaya’s first goal is to establish a karuta club in her school so she can officially join tournaments as a school group. Taichi is in the same school with Chihaya, and ends up helping her starting the club. In their first year, they managed to recruit 3 new members: Kanade, Tsutomu and Yuusei. Kanade is an elegant girl who really love Japanese classic poems. Tsutomu is a smart boy who used to only know about study. Yuusei was a strong karuta player back in elementary school, but stopped playing karuta after his lost to Arata. Later in the second year, the karuta club gets two more members: Sumire and Akihiro. Sumire joins the club because she likes Taichi. Akihiro is a good player in second-verse karuta, but a novice player in first-verse karuta. 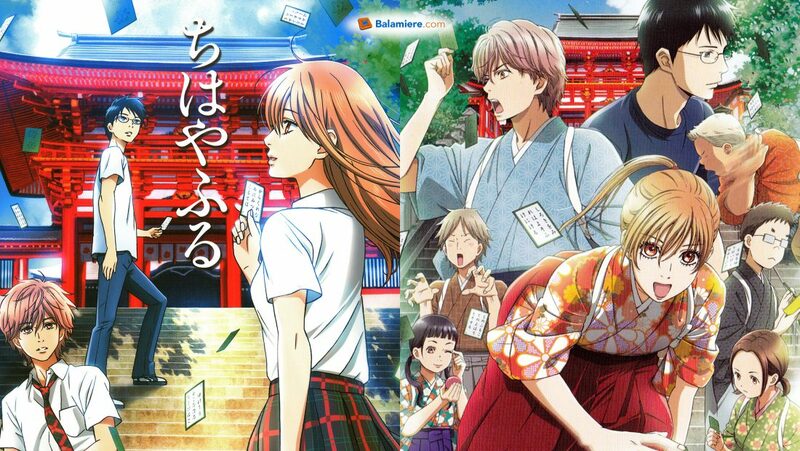 Chihayafuru is a story about Chihaya’s character development as she gives her best efforts to reach her dream. And I can assure you, it’s a journey worth watching. I was initially not impressed with the art style, but the story of this anime is really good I soon forgot about the art style issue. Very interesting story, strong and loveable characters, great competition and some very good music ! Recommended for all ages.